Most weekend afternoons are bustling with patrons at the Seattle Animal Shelter (SAS) as families visit in the hopes of adopting a furry family member. But recently, the shelter has been a bit quieter while the building undergoes renovation of its dog kennels, a project that requires most of the animals to reside in foster care for more than a month. In November, SAS foster families were called upon to take not just dogs but also rabbits, guinea pigs and hamsters that were displaced by the renovation. Amazingly and generously, the shelter’s volunteer community rose to the occasion and took nearly every dog and small animal into its collective care. Although few animals are currently residing in the shelter, fostered animals are brought in during open hours to meet with potential new families. 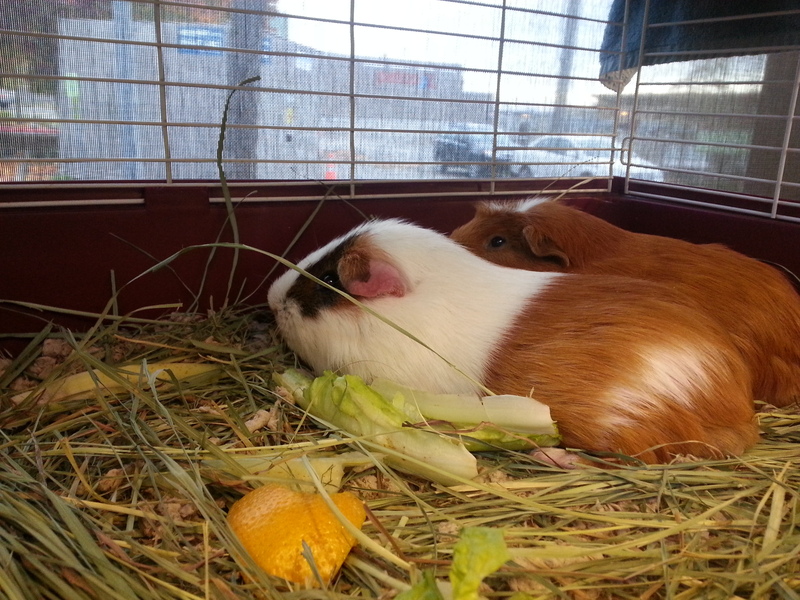 On a recent Saturday, SAS volunteer Rose Torbin introduced me to some guinea pigs that were spending the day in the shelter lobby for an adoption event. Torbin is part of the Critter Team at SAS, and she is also serving as a foster parent to two rats, Lucy and Pixal, during the renovation. It has been about a decade since the dog kennels had been upgraded. 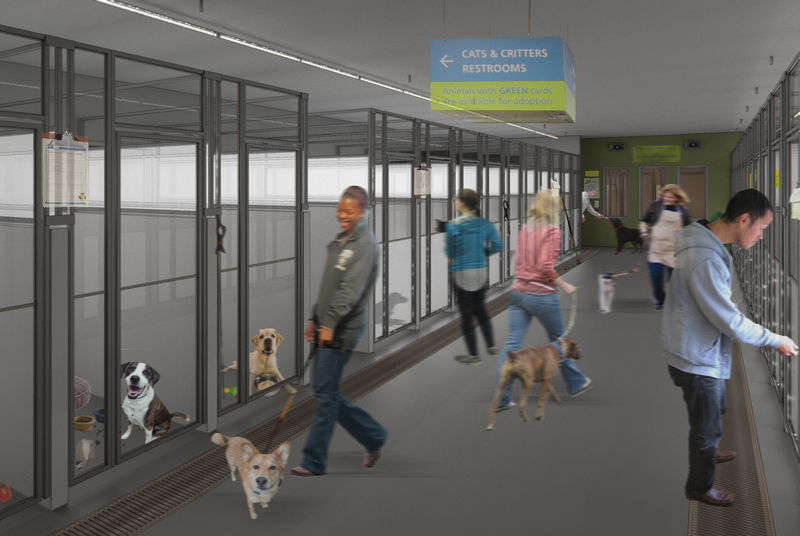 Thanks to an $80,000 grant from the Seattle Animal Shelter Foundation, $68,000 from the shelter’s Help the Animals Fund and $12,000 of city building funds, a three-phase project is being implemented to upgrade the entire facility. 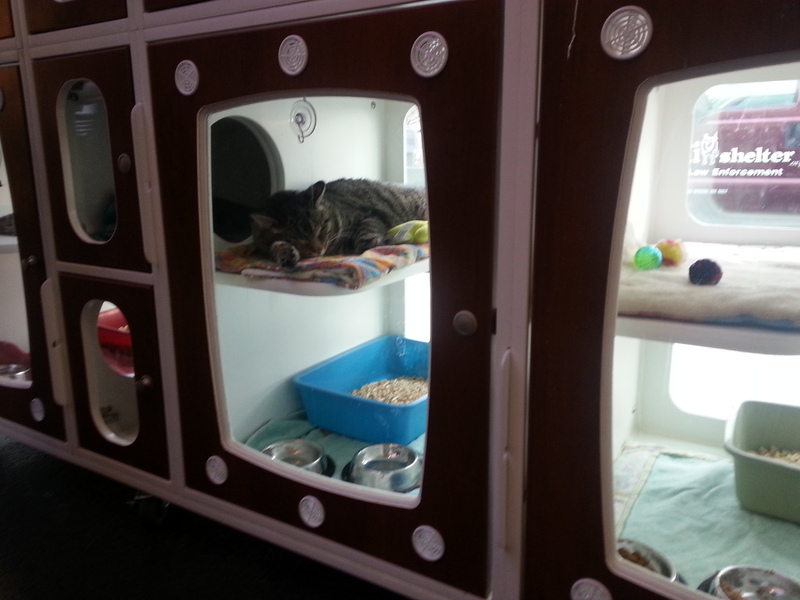 As part of phase one, cat condos were purchased for the front corridor of the shelter just last year, and the in-progress kennel upgrades are designed to make the space more dog- and adopter-friendly. Seattle Animal Shelter director Don Jordan explained that the kennels were once designed for a shelter where dogs did not stay long. But, today, the shelter boasts a 93-percent live-release rate for animals coming into their care. Live-release rates are a measure of how many animals can be successfully returned to their owner or re-homed upon arrival at the shelter, and this includes animals that are too sick or injured and must be euthanized. The kennel upgrades were designed by SHKS Architects in Seattle, and major work was well underway by mid-November. The chain-link doors on each kennel were removed, and all poles and sound baffling were taken out so the floors and walls could be resurfaced. Jordan explained that small dogs would often slip past the poles in the kennels; hence, the area was not safe for all dogs in residence. The newly renovated kennels will have glass doors with a visual barrier to calm dogs that are stressed by seeing other dogs nearby. Renovations are expected to be complete by mid-December. Phase two of the shelter renovations will include upgrades to the facility’s HVAC system. Jordan explained that improving ventilation should help reduce incidences of upper respiratory infections (URI) that commonly inflict dogs and cats residing in shelters or kennels. “Our goal is to create a healthy and happy environment as a whole,” Jordan said. Rabbits, hamsters, guinea pigs and other small critters will be the beneficiaries of phase three of the renovation project. Additionally, upgrades to the shelter’s kitchen and laundry areas are planned. Donations are needed to help fund phase three, and the shelter will work with the Seattle Animal Shelter Foundation for longer-term planning. Currently, critters are housed in four dog kennels separate from the main kennel room. The space is not ideal for smaller furry friends that are primarily housed in larger rodent cages placed along the walls. Upgrades to this area will include a more enriching space for these special creatures. During kennel renovations, the shelter is not taking in animals, but it has provided the public with alternatives for dealing with stray or surrendered animals. If you find a stray, you are asked to hold the animal and check for tags or ask a local veterinary office to scan for a microchip. With this information, list the animal on SAS’s Reuniting Owners with Missing Pets System (ROMPS) online database (web1.seattle.gov/dea/romps). You can also post the found animal on local blogs or put up flyers around the neighborhood to find the owner. In the event the animal’s owners cannot be located, SAS has partnered with local shelters, including Seattle Humane Society and PAWS, which have offered to take in surrenders during the temporary intake closure. Jordan said that people have been very understanding when they find they cannot surrender an animal during the renovation. Once phase one renovations are complete, the shelter will host a reopening event; watch its website for more information. In the meantime, animals in foster care and cats residing at the shelter are available for adoption. You can visit the Seattle Animal Shelter at 2061 15th Ave. W. in Interbay, and follow the shelter’s progress as it works to make our local animal shelter increasingly comfortable, welcoming and safe for animals and people alike. To foster, volunteer or adopt at the Seattle Animal Shelter, visit www.seattle.gov/animalshelter. To learn more or donate to the Seattle Animal Shelter Foundation, visitwww.seattleanimalshelterfoundation.org. CHRISTIE LAGALLY is a writer and the editor of Living Humane, a news site about humane-conscious lifestyles at livinghumane.com. She also writes a blog called “Sniffing Out Home: A Search for Animal Welfare Solutions” at www.sniffingouthome.org. The Seattle rain poured down so hard on Pioneer Square this September day that only a handful of people were waiting outside of the Union Gospel Mission homeless shelter. I was told to watch for a long line of people with their dogs, cats, ferrets and other animals waiting on the sidewalk for the afternoon Doney Memorial Pet Clinic. 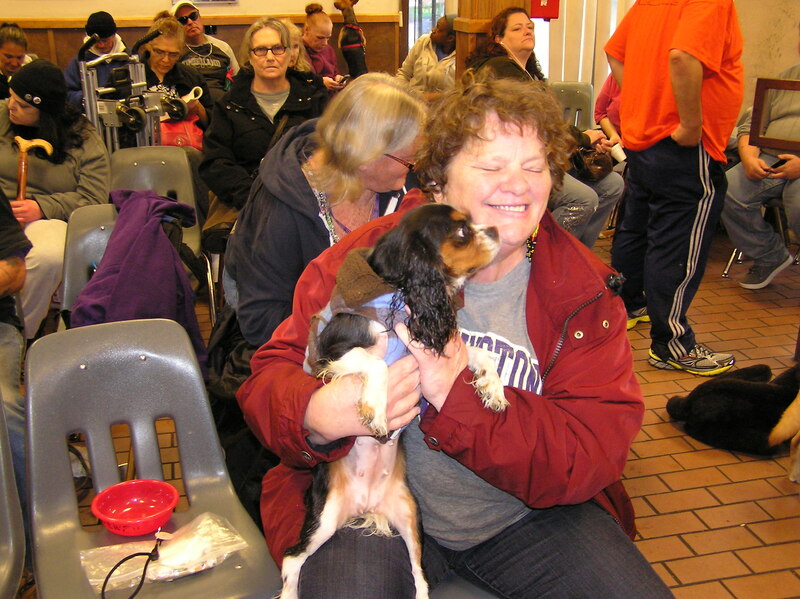 But this Saturday was too wet, and instead, the group was indoors, enjoying each other’s company and waiting a turn for veterinary care for their animals. For more than 28 years, Doney Memorial Pet Clinic has provided veterinary care to the animals of Seattle’s homeless and low-income residents. As I took cover inside the Union Gospel Mission, the multi-purpose room was being arranged as an impromptu pet supply store, as Carol Dougherty and her fellow volunteers were frantically bringing in donated bags of dog food out of the drenching rain. Part of the mission of the Doney Clinic is to provide clients with pet supplies. Dougherty was setting up shop for the afternoon. Volunteers at the Doney Clinic have their hands full on the second and fourth Saturdays of the month as they coordinate more than 50 people (and around 65 accompanying animals) who arrive early and wait several hours to see a veterinarian. Some pet owners are homeless while others are low-income, but they all share the compassion for their animals and the responsibility to get them veterinary care. Seattle resident Bill Smith was waiting for a diagnosis for his senior Malamute-mix dog, Princess, who was having trouble with stiffness in her legs. Smith has been coming to the Doney Clinic for roughly 20 years with dogs that he has rescued and taken care of until the end of their lives. “There are always dogs that need a home,” Smith said of the many dogs he has cared for over the years. Dr. Mona Radheshwar, DVM, was one of three attending veterinarians volunteering her time and skills for the clinic. One after another, Radheshwar saw cats, dogs and a tiny little kitten. Meanwhile, a veterinarian assistant who was there to hold animals, also attempted to configure better lighting in the rustic basement exam room, and other volunteers mopped up a rain-soaked floor and checked patients into the clinic. The Doney Clinic was started in 1985 by Dr. Bud Doney to provide veterinary care for the animals of homeless and low-income residents in Seattle’s Pike Street Market area. When Doney passed away, local veterinarian Dr. Stan Coe was instrumental in reviving this service in 1986. He and two fellow board members of the Delta Society, Louise Garbe and Don Rolf, took on the mission to run the clinic. Twenty-eight years later, these dedicated visionaries continue to ensure this service is available. From her Greenwood residence, Garbe takes care of paying the clinic’s bills and accepting donations from the public, and Coe regularly sees patients at the Doney Clinic. Back in the attending room, Radheshwar provides Smith with some arthritis medication but also recommends X-rays of Princess’ back. In these cases, when additional veterinary care such as x-rays or surgery is needed, clients are referred to a local veterinary hospital. Garbe explained that to help low-income or homeless residents pay for ancillary veterinary care, the Doney Clinic pays the cost for services rendered, but each client signs a contract agreeing to pay those costs back over time. Additionally, the local vet clinic graciously discounts its services for Doney Clinic clients. As Smith arranges final paperwork for Princess, about 30 people and their animals are still patiently waiting. Now, several hours into the clinic, many in the waiting room had picked up donated dog or cat food from the clinic pantry and were provided with leashes, pet beds, dog coats and other donated accessories to meet each animal’s needs. A few new clients stagger in from the rain to see if there is any dog food left. Luckily, with today’s large donations, there was enough food to go around, but the shop was out of cat litter before the end of the day. Donations of cat and dog supplies come from a variety of locations, including pet supply stores. All the Best Pet Care in Queen Anne maintains an ongoing collection bin for food and supply donations. “[The Doney Clinic] often lets us know what they need most,” explained Amanda Fox of All the Best Pet Care. Fox said that when customers ask what would be helpful to donate, the store recommends items that the Doney Clinic needs. 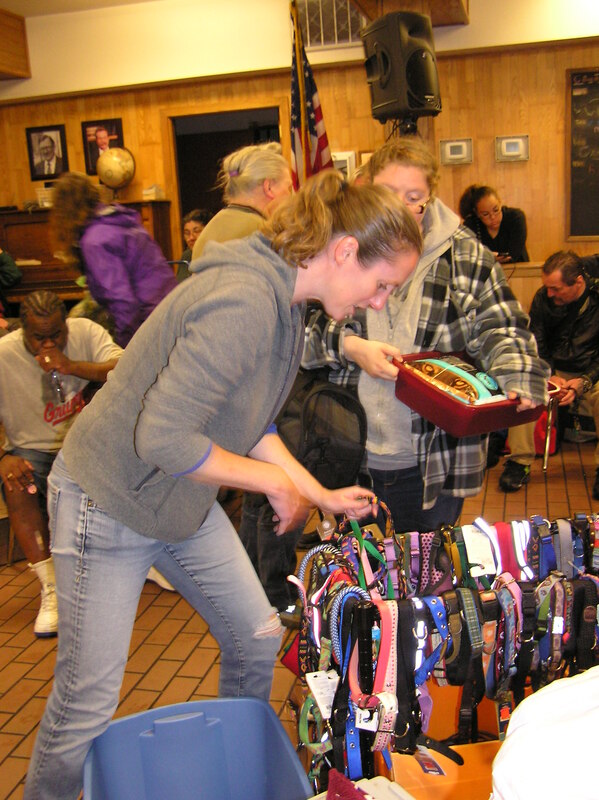 Donations of used leashes, coats and beds are also gratefully accepted from the public. As the hectic afternoon began to wind down, I got a chance to pet a few dog ears and scratch the chins of some patiently waiting cats. I could not help but stand in awe of the enormous coordination it takes to bring the Doney Pet Memorial Clinic to life on these Saturday afternoons. The volunteers, the veterinarians, the assistants and the dedicated pet owners each expertly played their part to ensure that this special community of animals gets the care they need. 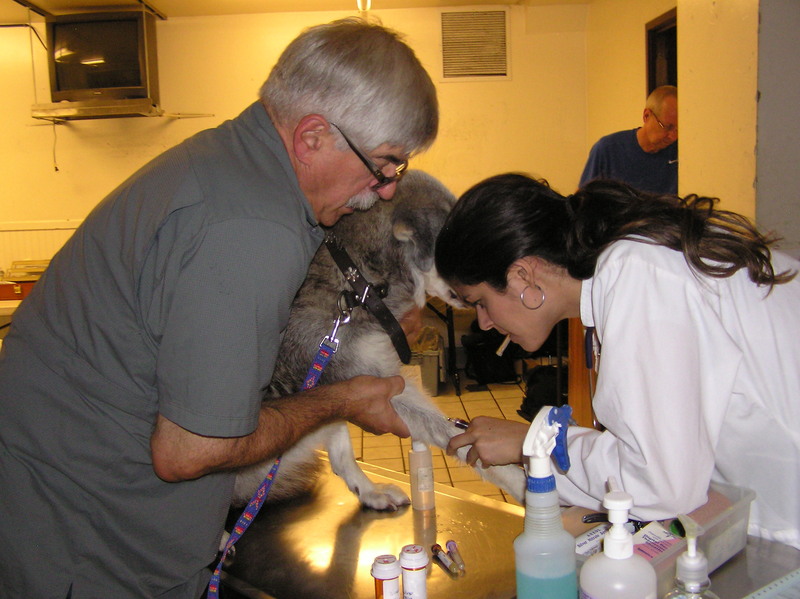 To learn more about the Doney Memorial Pet Clinic or to donate or volunteer, visit http://www.doneyclinic.org. CHRISTIE LAGALLY is editor of Living Humane (livinghumane.com), a news site on humane-conscious lifestyles. She also writes a blog called “Sniffing Out Home: A Search for Animal Welfare Solutions” at http://www.sniffingouthome.org.